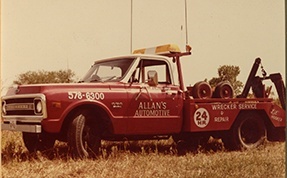 Allan's Wrecker Service was founded in 1978 by Allan Miller and started out with one home built light duty wrecker. Over the years, hard work and a professional attitude has grown the company to a fleet of over 35 pieces of equipment. 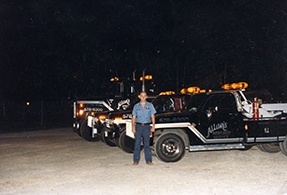 Even though Allan's Wrecker Service has grown into a large company the history of how it all started has not been forgotten. Without customers putting their faith in us to handle the job we wouldn't be where we are today. Our goal is to provide our customers with a first class service of damage free towing and recovery at an affordable price in a timely manner. All of our drivers are state licensed, have clean backgrounds, and certified through state accredited courses to ensure your job is in the best hands.